- This product will function on all TJs but not the TJ Unlimited. 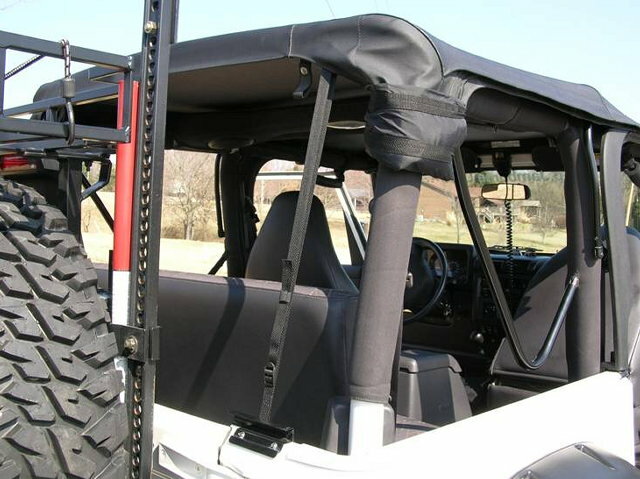 Furthermore, it will function on JK 2 door 07 and 08 Jeeps. 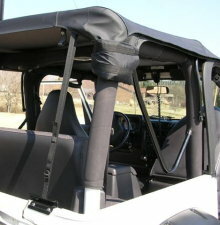 The 09 JK 2 door has a stiff piece of "plastic” hot taped into the sail panels whereas the product will not work. The noise level is greatly reduced at highway speeds, with the side and rear windows out, making conversation and listening to the radio possible. No more stopping in order to attach a sail panel that has become detached. With the sail panels up and out of the way visibility is greater and the sail panel is protected during off roading. Don't be caught without your top when you need it. Great to use with a Window Roll, part of the Clover Patch system.